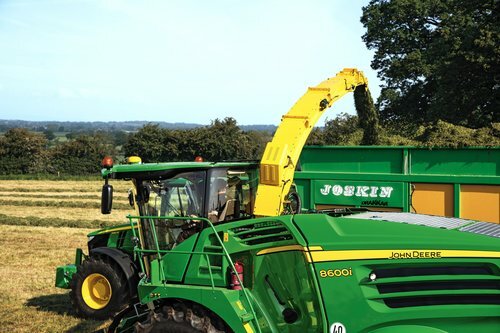 John Deere’s new 8000 Series self-propelled forage harvester and 6R Series mid-range tractor, both featuring the company’s latest fuel-efficient, Stage IV compliant engines, are making their Royal Highland Show debut on the John Deere stand on Avenue S in June. Spearheading the 6R Series mid-size tractors from Mannheim, the six-cylinder 6215R on show features enhanced manoeuvrability, improved operator comfort and an industry leading extended service interval of 750 hours. The tractor is powered by a new 6.8-litre engine rated at 215hp (97/68 EC), with an extra 40hp boost available for transport and pto work from the intelligent power management (IPM) system. Fuel efficiency of this new model can be enhanced by choosing either the established AutoPowr continuously variable transmission or the new, advanced double-clutch DirectDrive transmission. The new CommandARM – as featured on John Deere’s latest 7R and 8R Series tractors, also being displayed on the Highland Show stand – incorporates an electronic joystick and a Generation 4 CommandCenter display. In addition, this FarmSight-ready 6R Series tractor can be fitted with JDLink telematics as an option, to include new remote display access (RDA) and wireless data transfer (WDT) linked to the MyJohnDeere.com website portal.